In 1894, a strike at the Pullman Palace Car Company spread across the nation as the American Railway Union organized a national boycott and strike against all trains hauling Pullman cars. Strikers were met with the full force of company and government might. Thirty-four people were killed in two weeks of clashes between troops and workers across the nation. 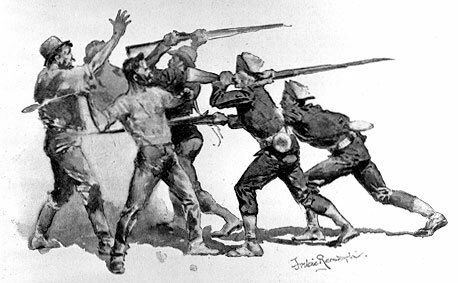 An ardent admirer of the military, artist-reporter Frederic Remington displayed no sympathy for the Pullman strikers in his reports for Harper’s Weekly. Endorsing suppression, Remington described the strikers as a “malodorous crowd of foreign trash” talking "Hungarian or Polack, or whatever the stuff is."